I got late word of the names at the Ribfest this year, only hearing about it 2 days before the event on the radio. Rudy’s decided to post 2-3 Longhorns at every location as coaches for the local high schools to egg the kids on eating as many ribs as they could, with the donations going to Habitat for Humanity. Jeremy was a late add to the Round Rock location alongside James Kirkendoll, and went to TCU, (and not Texas,) setting me into a scramble to even find one card of his. (He did go locally to Hutto High School- home of the hippos.) After calling the local card store and determining that they didn’t have any cards of Jeremy, I searched through my card boxes in a last ditch effort to find one of him, and amazingly I found this Score 2012 card of him buried in a box. While not my favorite design, Score once again rides to the rescue with its depth of available player cards that trumped even Topps in value and typically decent design. Kerley’s career at TCU certainly started off slowly, as in his first two years at the school he totaled 20 catches converting from quarterback, but then in his Junior year in 2009 he put up 44 receptions for 532 yards and 2 touchdowns from quarterback Andy Dalton. In his senior season, Jeremy capped off his career by recording 56 receptions for 575 yards and 10 touchdowns in 2010. A dangerous return man he won honors in the Mountain West Division in both 2009 and 2010 for his special teams skills. 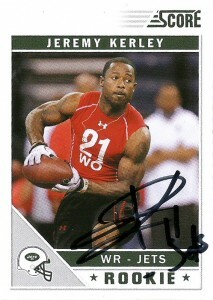 The Jets took Kerley in the 5th round of the 2011 draft. Jeremy had a modest rookie year, hauling in 29 receptions for 314 yards and 1 touchdown- mostly after the departure of Derrick Mason. He’d also chip in 29 punt returns for 314 yards and a 10.5 average. Kerley had 5 returns of longer than 20 yards and a long of 53. As 2012 opens it appears that the Jets have more in store for their young multi-talented athlete.